R.E.M., it’s safe to say, had not gone collectively mad. Several things had happened since Automatic for the People. The band had decided that, if they were going to tour, it might be good to have some bigger, louder, more arena-ready material to take with them. Bill Berry in particular had been keen to make a louder record after Out of Time, but all their strongest material was acoustic, so they recorded that instead and didn’t tour behind the album. This time round, though, he was insisting the band plug back in and turn it up. Finally, and here we’re into the realms of speculation, the emergence of Nirvana et al. 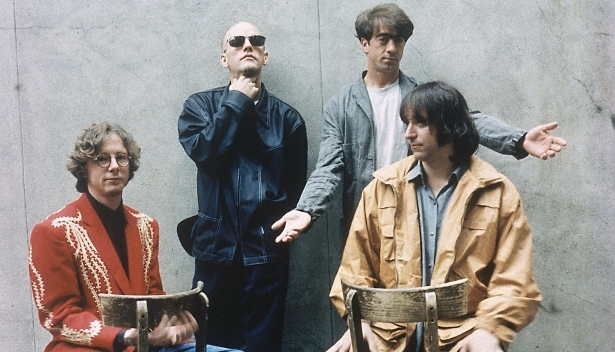 over 1991 and 1992 had created a very different environment to the one in which R.E.M. had last been a working ‘rock’ band; this one was more sympathetic to them, indeed looked to them as inspiration, and they likely felt eager to align themselves with it. That Cobain died in the middle of the Monster sessions doubtless put a crimp on this, but it seems reasonable to guess it was part of their thinking when they began. Monster‘s basic tracks were cut by Scott Litt and David Colvin on a soundstage in Atlanta, with overdubs added at Criteria in Florida, Ocean Way in LA, and Kingsway in New Orleans. This was a big-budget, protracted process, and the finished album suggests a degree of overthinking. A natural response to the idea of a making a road-ready rock album would have been to cut the album essentially live, add just the minimum of overdubs, and mix it so that the vocals were perhaps a touch sunken in, with the bass and drums forward and the guitars (maybe one each side to reflect the fact that the band would tour with a second guitarist) left to glue everything together. That’s not quite what Monster is. The guitars, on the louder tracks, are thrust to the very front of the mix, making the rhythm section sound tiny in comparison, and leaving Stipe near inaudible. The latter is not a big deal; R.E.M. had made a lot of records at the start of their career where Stipe’s vocal was low in the mix and there’s plenty of precedent for low-mixed vocals in rock, from prime-era Stones onwards. But a rock album where the bass and drums aren’t providing the tracks’ energy and ‘push’ is not likely to be wholly satisfying. Now, whether Litt and the band decided to spotlight Buck rather than Berry because the latter’s drum tracks didn’t quite come up to snuff or (more likely) because they ‘big guitars’ was the fashionable thing to do, who can say. Litt, in any case, is not a producer noted for his work with heavy bands. But it’s noticeable how much more depth and power the drums have at the start of I Don’t Sleep, I Dream (track 4) than they do on the previous three songs, simply because they’re not competing with a big wall o’Buck. So the sound of Monster isn’t that of a straightforward rock album. But neither are the songs straightforward rock songs, in either form or content. Many critics of R.E.M. have noted that their songs often lacked really strong choruses, a strange quality given that this band was once arguably the biggest in the world. This observation is overstated on the whole, and it misses the point that R.E.M. songs work by the accretion of one small hook after another, rather than by having one big killer chorus (although they’ve done that too on occasion). But Monster does have a few songs that seem to deflate a bit they get to the chorus; Star 69 and Bang and Blame are the biggest offenders, the latter really suffering because of how promising the verse is. That’s not true of all of its tracks, though. If Monster is, Kenneth apart, better in its softer moments (I Don’t Sleep, I Dream; Strange Currencies; and Tongue, a falsetto soul ballad that succeeds in spite of the fact that Stipe is not Al Green), its last third is its strongest. I Took Your Name, with Stipe’s arch Iggy Pop-as-corporate-drone vocal, takes the sawing tremolo guitar from Crush With Eyeliner but puts it to more intriguing use, without Thurston Moore stunt casting; Let Me In – the band’s Kurt Cobain tribute – has a beautiful, incandescent distorted guitar sound and Stipe’s most plaintive and emotionally direct vocal on the record; Circus Envy thins out the guitars and lets Bill Berry push the song on, which challenge he responds to; and album closer, You, combines a thumping floor-tom rhythm with a throbbing D-minor guitar drone and an eastern-tinged riff, finishing the album on an ominous, ambiguous note. Monster functions as a conceptual unity, too, with song after song about the nature and fluidity of identity and sexuality, Stipe’s lyrics often seeming to run counter to the music, so that one seems to be a commentary on the other. It’s worth bearing in mind the difficulty of the task Stipe was faced with in writing lyrics for a rock album after two widely praised but often sombre and meditative records. The band may have been able to take a cue here and there from their contemporaries, but Stipe couldn’t have borrowed another writer’s idiom (whether that writer had been Eddie Vedder, Thurston Moore, Cobain, Jerry Cantrell, or anyone) without it being utterly crass and inappropriate. He had to define his own themes and style for this record, and he more or less completely succeeded. That was no small achievement. Yet Monster will forever be known as the record that second-hand shops won’t touch; the record that 4 million people bought and 4 million people sold back. It wasn’t the triumph that Automatic was, and it’s not as various as New Adventures in Hi-Fi (on which, as a bonus, the band does sound more like a band), but it deserves a way better rep than it currently has. There probably won’t be too many ‘Monster at 20′ retrospectives this year, but if there are, let’s hope they give an undervalued and brave record a fair shake. 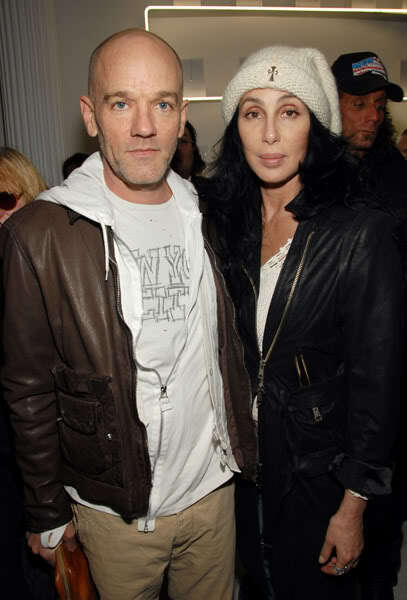 This is a picture of Michael Stipe and Cher – does there have to be a reason? This entry was posted in Music and tagged Al Green, Automatic for the People, Band and Blame, choruses, Circus Envy, Cobain, Criteria, Crush With Eyeliner, David Colvin, Eddie Vedder, Florida, Georgia, guitars, I Don't Sleep I Dream, I Took Your Name, Jerry Cantrell, Kingsway, LA, Let Me In, Monster, New Orleans, Nirvana, Ocean Way, Out of Time, R.E.M. Monster, recording on a soundstage in Atlanta, records that sound strange, Scott Litt, Star 69, Strange Currencies, Thurston Moore, Tongue, vocals buried in the mix, wall of guitar, What's the Frequency Kenneth, You on June 15, 2014 by rossjpalmer.